Prevent & Fix is a deep muscle therapy and pain management center servicing Scottsdale and Phoenix, Arizona. This is one of a small number of therapeutic centers in the country specializing in a holistic approach of treating pain and inflammation through an innovative combination of muscular/skeletal and nerve/muscular therapy. Voted 2015's best Physical Therapist in Scottsdale for Physical Therapy treatment and services as reviewed by patients. 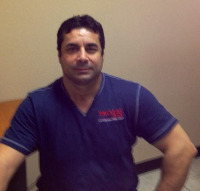 Grigor Oganyan, owner of Prevent & Fix, studied deep tissue therapy at the Armenian Institute of Physical Culture (U.S.S.R.) and graduated in 1982 with the qualification of a physical therapist. Two years later, Grigor worked with the national wrestling team as a massage therapist for U.S.S.R. (Armenia) specializing in sports massages. In 1988, he attended a massage school in Santa Monica where he took advanced courses in massage therapy. Grigor graduated from California School of Medical Sciences specializing in advanced sports and dance injuries two years later. From 1988 to 1991, Grigor worked as a massage therapist with Ursula Adam Institute de Beauty Paris in Beverly Hills, California. From 1991 to 1998, he worked with the Jonathan Private Club as a massage therapist in Los Angeles, California. Grigor Oganyan then moved to Arizona and worked as a massage therapist with Hygia Spa in Scottsdale, Arizona from 1999 to 2011. Grigor Oganyan expanded and is currently working in Scottsdale, Arizona running the Prevent & Fix therapeutic center. Professional basketball player who plays point guard for the Phoenix Suns of the National Basketball Association (NBA). American swimmer who competed in the 1996, 2000, and 2004 Olympics and won ten Olympic medals (5 gold, 3 silver, 2 bronze). English actor, best known for portraying British secret agent James Bond in seven films. American film, stage and actress, director, producer and former model, best known for her role as Sue Ellen Ewing on the television prime-time soap opera Dallas. Played for the Phoenix Coyotes, a Canadian professional ice hockey centre who currently plays for the Calgary Flames of the National Hockey League (NHL). American professional baseball pitcher who is currently in the Cincinnati Reds organization, now retired. American professional basketball player for the Chicago American Gears of the National Basketball League (NBL) and hall-of-famer for the Minneapolis Lakers of the NBL. Italian bodybuilder won all the major bodybuilding and powerlifting titles in the world, including Mr. Olympia twice.